Dr Hugo Sachs is President of the Australian Dental Association. A rural practitioner based in Harden, NSW, Dr Sachs graduated from the University of Sydney in 1979, receiving his Master of Dental Surgery in 1983. Active in the NSW Branch of the ADA since 1999, Dr Sachs became a Federal Councillor in 2004 and was elected President last November. Consumers are questioning the value of their private health insurance. I would like to give the Australian Dental Association’s (ADA) perspective on private health insurance and out of pocket expenses. When it comes to general treatment (extras) policies, the majority of rebates paid out to policy holders are for dental services claims – over 54 per cent on average. This is followed by optical at 15 per cent and physiotherapy at 9 per cent1. While the dental share might sound large, nationally private health insurance contributed 18 per cent of the $9.6 billion paid for dental services in Australia. Individuals still paid the most, via direct out-of-pocket expenses (57 per cent), followed by government programmes (24 per cent)2. The main contributor to this trend is that private health insurers have not adequately increased rebates in step with the premium increases policy-holders pay every year. Private health insurance consumers pay more in policy premiums than what they received back via benefits or rebates, to the tune of $6.2 billion over the last five financial years. Consumers receive less yet pay more. There is another level consumers need to assess. Do the rebates they receive under their private health insurance policies perform a reasonable job at lowering out-of-pocket costs for health services? The ADA conducts an annual fee survey of the average increase in dental fees. The chart below tracks these increases against the health CPI and the average annual private health insurance premium increases over the last five years. 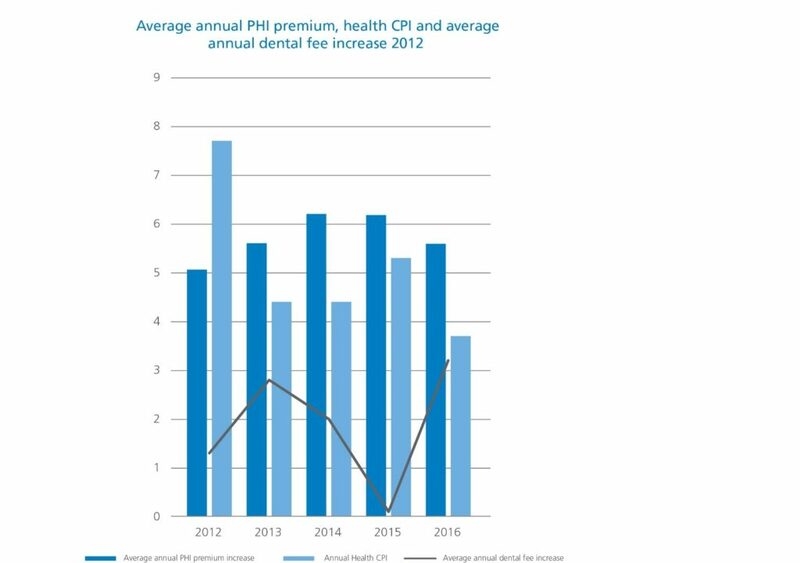 Over the last five years, average dental fees have been lower than the annual health cost-of-living increase and private health insurance premium increases. With the exception of 2012, premium increases have been higher than the health cost-of-living index. This analysis confirms the ADA’s and CHOICE’S conclusion that rebates have failed to adequately reflect increases in the premiums consumers pay. By having stagnant rebates, the private health insurance industry has essentially been gouging money from consumers. Not only has this been happening for many years, the private health insurance industry has deflected the blame and attention for consumers’ increased out-of-pocket costs onto fees charged by health service providers, particularly dentists. The ADA has received complaints that when a policy holder calls their private health insurer to obtain information about their rebates for their dental treatment, the insurer’s call centre staff use this opportunity to assert to the policy holder that the dentist they are considering is ‘too expensive’. The policy holder is then encouraged to consider one of the insurer’s ‘preferred providers’ or ‘network dentists’ (in other words, healthcare providers contracted to the insurer). The problem is that it may not be true that the original, non- contracted dentist’s fees are higher than the contracted providers. In fact, private health insurers use discriminatory rebate regimes to make their contracted providers appear more attractive. A policy holder will receive a higher rebate if they attend a contracted provider than if they continued to see their original dentist. There is no level playing field for fair competition, as the original dentist’s fees may actually be lower than the contracted dentists but the consumer may no longer have dental treatment with this dentist. First, discriminatory rebate regimes create two tiers of policy holders. Is it fair that the first policy holder is punished for exercising their choice to go to a particular non-contracted dentist? The first policy holder is effectively subsiding the other one to obtain a higher rebate, yet the former does not receive any immediate benefit. This is patently unfair. Second, the continuity of care of the policy holder who chooses to see their non-contracted dentist is being interfered with by these practices. Continuity of care is crucial to ensure the best possible health outcomes for a patient. Any issues that may arise are most likely to be identified and treated appropriately rather than if a patient were to see a different practitioner each time. Discriminatory rebates and contracted provider arrangements are a direct attack on continuity of care, which is not in the best health interests of patients. Third, insurers can cross subsidise the provision of these discriminatory rebates as a means to ultimately run out independent, smaller dental practices in a manner that does not improve the quality of dental care provided nor the range of healthcare providers available to consumers. It is reducing consumer choice and thus in the long term reduces competition. Problems with the private health insurance industry and their impact on patients are the reasons why the ADA has embarked on its Time2Switch campaign (time2switch.com.au). Time2Switch provides the public with an independent, dental profession-developed comparator that assesses private health insurance policy’s rebates for general dental, major dental, endodontic and orthodontics services. The ADA’s Time2Switch website’s comparator aims to simplify choices by assessing health fund dental rebates as a proportion of the average fee for the particular service, and how these rebates compare to other insurers’ policies. To persuade the Australian Government to institute much needed reform so that consumers receive more value for money for their policy, and their choice of provider, and continuity of care, is not compromised. 1, 2AIHW Health Expenditure in Australia, 2014-15.